The House of Representatives approved on second reading a bill seeking to provide 100 days of paid maternity leave for employed women in the government, private and informal sectors on Tuesday, August 22. House Bill No. 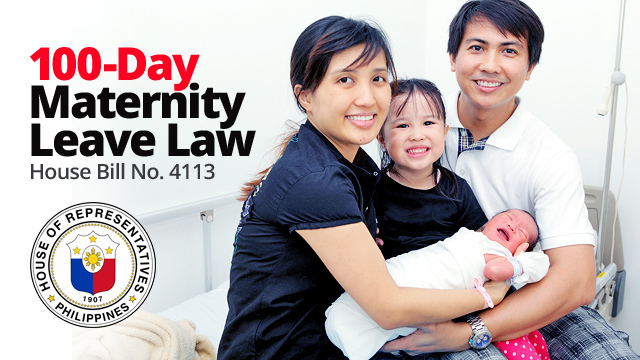 4113 or the “100-Day Maternity Leave Law” was passed on second reading in Congress through via voce or voice voting according to a report by Inquirer.net. The bill, sponsored by former Rep. Emmeline Aglipay-Villar, who is now an undersecretary at the Department of Justice, hopes to grant 100 days of paid maternity leave to any female worker in any sector, regardless of civil status or legitimacy of her child, provided that she has at least three monthly contributions to the Social Security Services (SSS) on the year before she had childbirth or miscarriage. New moms will also have an option to extend their maternity leave to 30 days more, but already without pay. However, employees who work in microbusinesses, defined as those that have less than Php3 million worth of total assets, and establishments that have less than 10 workers are exempted from the bill’s provisions. Congress’ version of the bill is slightly less generous than what the Senate proposed last year in the “Expanded Maternity Leave Law of 2017,” which seeks to grant female workers with 120 days of paid maternity leave and with a similar option to extend it for another 30 days without pay. Senate Bill 1305 even gave new fathers the benefit to enjoy 30 days of paid leave. Nonetheless, both measures propose significantly longer periods of paid leaves than what is currently provided by the Philippine Maternity Leave Law: 60 days for working mothers and seven days for fathers. The law was last revised in 1992. But whichever version gets enacted into law, an update on the Maternity Leave Law will allow the Philippines to comply with International Labor Organization’s Convention 183 which mandates a minimum of 98 days of paid maternity leave. The country’s maternity leave benefit may even end up more generous than the ones provided by other rich neighboring countries such as South Korea and Thailand, which only require 90 days of paid leave and China that only gives 98 days. Still, it may take some time before Congress’ measure gets enacted into law as it still has to go through third and final reading and has to be reconciled with the Senate’s version. After that, the Philippine president needs to sign the bill for it to become law.